Well, let’s look at my day to day life. Although I am indoors, I have LOADS of room to move about. Did you know that indoor rabbits with access to a room or rooms get more exercise than those kept outside, therefore making them fitter and less likely to develop osteoporosis and painful spinal arthritis? I am over 10 years old now and have no intention of slowing down and still get about as well as I did when I was younger. I also have the benefit of access to a large garden - ideally, your rabbit should have somewhere outdoors where they can run around and munch on grass. My lifestyle and those of my two (human) housemates seem to go hand-in-hand. Bunnies are crepuscular which means we are most active at dawn and dusk, so in the morning when they get up, I’m already up and about in the kitchen, looking bright and alert (unlike them!) After they go to work, I keep myself occupied until late morning when I’m ready to start settling down to some beauty sleep, which will normally last until one of them gets home about 5pm. After that, we have lots of time for interaction, as well as the opportunity for me to pop into the garden for some grass munching - nom, nom! 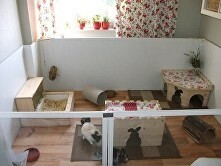 Rabbits are social animals and enjoy companionship with humans. 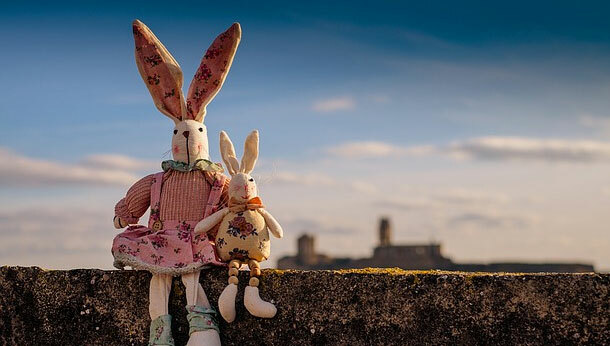 You will find that the more time you spend with your rabbit, the better the bond you’ll develop with us (which means happy bunny and even happier human!) 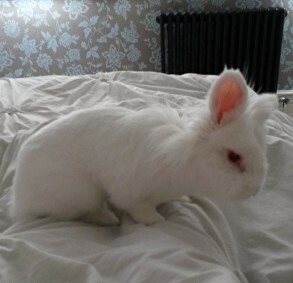 Having your rabbit used to being in the house makes it easier to sit down with them for grooming and cuddles because let’s face it, when it’s raining or when it’s cold, who wants to go into the garden to visit bunnies in their hutch? Easily litter trained and, once trained, will always use our litter tray. Even when I’m in the garden I will go indoors to use the litter tray! 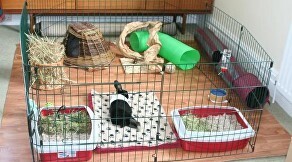 Clean - rabbits thoroughly groom themselves several times a day. I always like to look pristine, especially after a good digging session. Affectionate - who doesn’t love bunny kisses when they get home from a long day at work?! Entertaining - I may not sing or tell jokes but my housemates seem pretty entertained by watching me. Hell, even the gasman forgot what he was in for the other day as he was so taken by me! 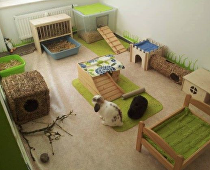 Below are some ideas for indoor set-ups for your rabbit - in fact, it's given me some ideas that I'll be passing on to my housemates (#Granddesigns). P.s. 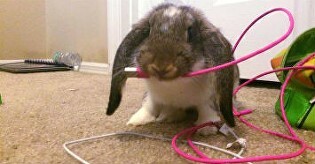 remember to bunny-proof your house!